• Includes 10 minifigures: The Joker™, Batman™, Barbara Gordon, Harley Quinn™, Nightwing™, Alfred Pennyworth™ Classic Batsuit, Disco Batman™, Disco The Joker™, Disco Batgirl™ and Disco Robin™. • Features a grand entrance flanked by 2 buildable bombs with translucent spark-style elements, 2-level and 3-level towers with turrets and flag elements on top, a rollercoaster track and train with 3 cars (each with a minifigure seat), rotating ‘big eye’ tower with lever-operated iris to ‘look’ up and down, huge buildable The Joker™ head with trapdoor and slide, rocking ‘The Joker’ sign, ‘Ha! Ha!’ sign, 2 wheel-operated punching boxing gloves, plus many multicolored, translucent light-style decorative elements. • Activate the trapdoor to send a minifigure tumbling from the top of the The Joker™ head, down the slide and out through the mouth. • Interior includes an entrance hall with 4 plastic, bendy ‘mirror’ elements; living room with a buildable grand piano and stool, bust, and fireplace with translucent-red fire-style elements; cinema room with a screen, minifigure seat and assorted elements including a romantic DVD; kitchen with cup, pot and pan elements, and a buildable microwave with lobster, lemon and plate elements inside; music studio with a buildable mixing desk and loudspeakers, seat and a guitar element; swimming pool room with translucent-blue water-style elements; and an attic with 2 buildable boxes and a rat figure. • Weapons include Batman’s Batarang, Barbara Gordon’s revolver and Harley Quinn’s bat. • Disco Batman™, Disco The Joker™, Disco Batgirl™ and Disco Robin™ minifigures are new! 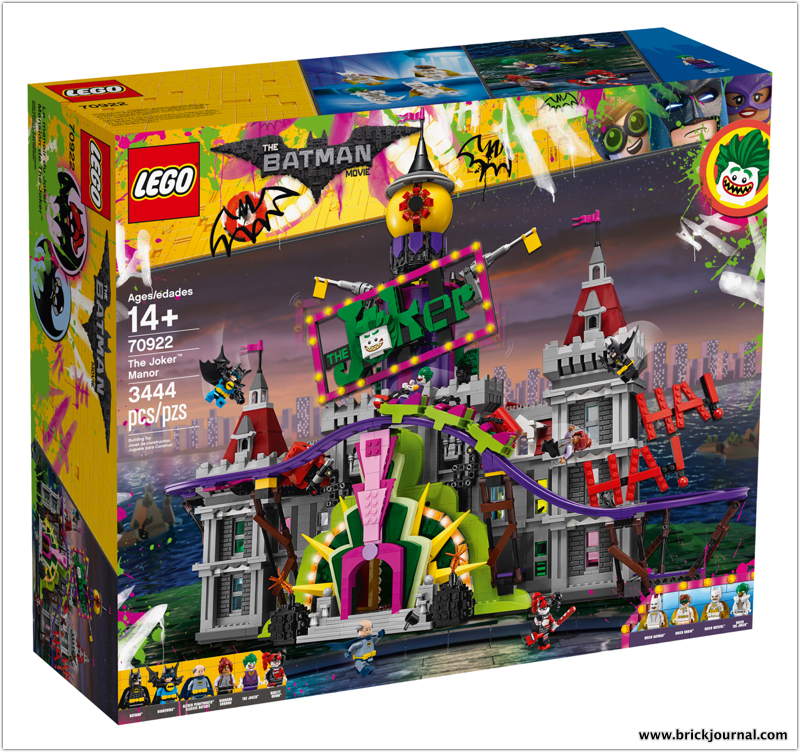 • Recreate and reimagine memorable scenes from THE LEGO® BATMAN MOVIE. • The Joker™ Manor measures over 21” (55cm) high, 25” (66cm) wide and 10” (27cm) deep. • Rollercoaster train measures over 1” (3cm) high, 5” (15cm) long and 1” (3cm) wide. ← Experience the Mountain Cave!